MSD Performance Products are leaders in the aftermarket and known for their wiring, electrical, ignition system components, and other high performance parts. They are constantly adding to their catalog in order to meet the needs of at home mechanics, restoration specialists, and racers. Their newest addition of parts will help you elevate your build. New additions to the MSD catalog include the release of Pro Mag A/Fuel Power Grid Controllers, and also a large assortment of replacement ignition parts. Learn more about the new products in the official release below. 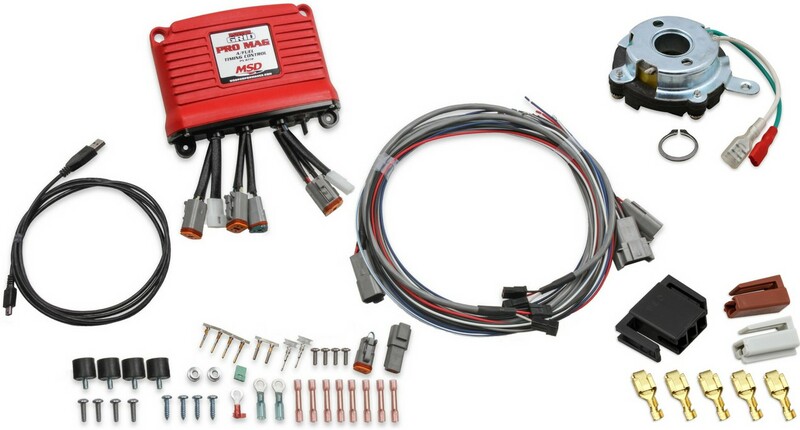 Holley/MSD is pleased to announce the release of Pro Mag A/Fuel Power Grid Controller and a large assortment of replacement ignition components. The Power Grid lets tuners make last-minute decisions right in the staging lanes, and the replacement parts include an array of eight different cables, harnesses, and magnetic pickups. MSD Pro Mag A/Fuel Power Grid Controllers allow drag racers to control ignition timing by time with either a PC or mobile device. Designed for use with the MSD Pro Mag 44, it has dual outputs so it can be used both single and dual Pro Mag 44 ignitions with a crank trigger system and MSD nonmagnetic pickups. With MSDView, you can create and store up to 12 unique timing maps that can be overlaid to help you select one right up to the last minute before the engine is fired. Timing curves can be programmed with up to 30 points at 0.1-degree increments at intervals of just a hundredth of a second. MSD Pro Mag A/Fuel Power Grid Controllers also feature individual cylinder timing, throttle-lift timing retard, throttle-inhibit timing retard, and a auto-pickup signal selector that triggers the dead channel if a crank-trigger pickup fails. Genuine MSD service parts, including replacement cables, wiring harnesses, and magnetic pickups, are available for a variety of applications. They’re the exact same products that came from the factory – connector kits for GM HEI distributors, magnetic pickups for HEI distributors, shielded mag cables, and four different kinds of harnesses.